1 L of water is heavier than 1 L of oil because water is than oil. Very hot water is than room temperature water. If salinity increases in seawater, where does that go and why? It sinks because it is more dense. It sinks because it is less dense. It floats because it is less dense. It floats because it is more dense. At which end of the rope is the wavelength is always greatest? Wavelength is the same throughout. At which end of the rope is the wave speed is always greatest? Wave speed is the same throughout. 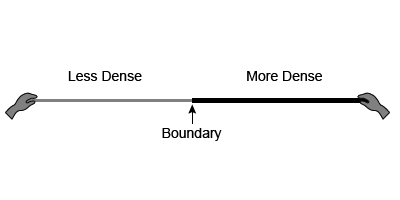 The is the least dense layer of Earth. Which of the following anatomical structures contain the most dense connective tissue, dense regular? there is more air than helium. helium is less dense than air. helium is as dense as air. helium is more dense than air.